How much time should I spend in Tokyo? Tokyo was the beginning of our trip to Japan. We’ve already seen a lot in this world, but Tokyo really blew our minds. So many people, so many crazy sights, so many great observation points – it's virtually impossible to fully appreciate Tokyo in just a few days. To really understand and get to know the city, you’d probably have to spend a year or so here. We didn’t have that much time, and you probably don’t either. 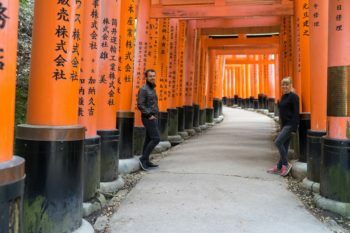 So in this post we’ll provide you with a comprehensive first-time visitor’s guide covering all the most important sights in Tokyo, which you’ll definitely be able to cover in a few days. 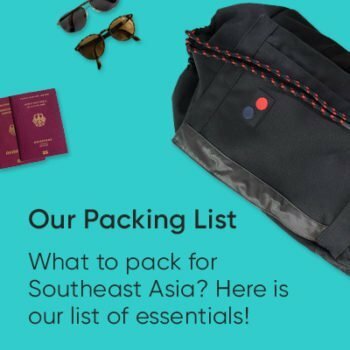 We’ll show you our highlights and give you a few practical travel tips to help you get started in this amazing metropolis. To avoid having to keep scrolling endlessly, we’ve created a table of contents at the beginning, which you can use to jump to a section of your choice. When we first started planning our trip to Tokyo, we were overwhelmed by the incredible size of this city. 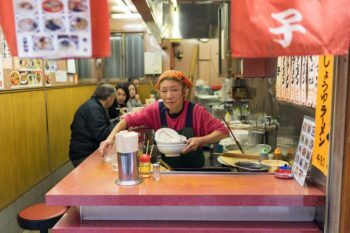 To help you find your way around, we’ve grouped the Tokyo sights here according to neighborhoods. This should help you to get a first impression of Tokyo so know which sights you should visit in one day. We’ve drawn you a sightseeing map showing the location of the individual neighborhoods. 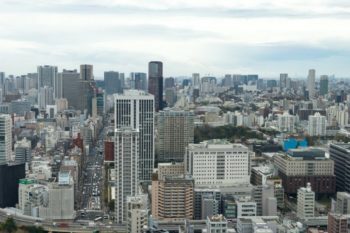 Tokyo consists of 23 neighborhoods in total – the major tourist attractions are located in the 6 neighborhoods we’ll be covering in this post. Fun fact: The city of Tokyo was officially dissolved in 1943. 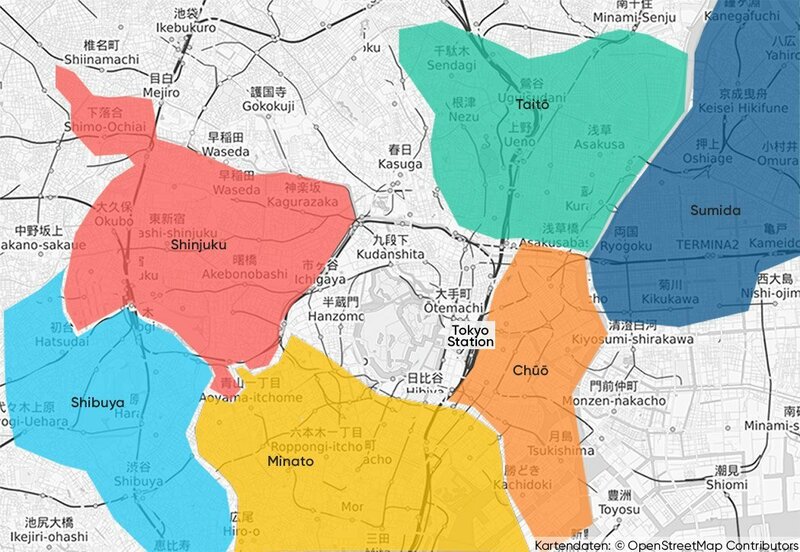 Officially, the districts are independent municipalities, but of course they’re still collectively known as Tokyo. Tokyo consists of 23 neighborhoods in total – the major tourist attractions are located in the 6 neighborhoods we’ll be covering in this post. Sights and attractions sorted by neighborhood. 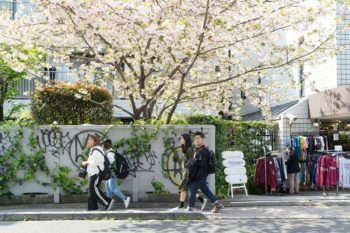 The Taitō neighborhood is located in the east of Tokyo and offers two major highlights for visitors. Ueno Park is a large park with two beautiful shrines. 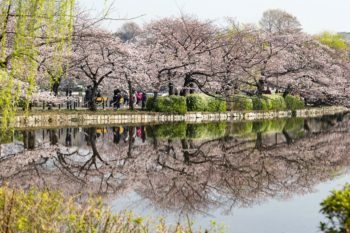 In our opinion, Ueno Park isn’t an absolute must-see in Tokyo. The park is beautiful and the shrines are worth seeing, but there are much greater highlights in the city. 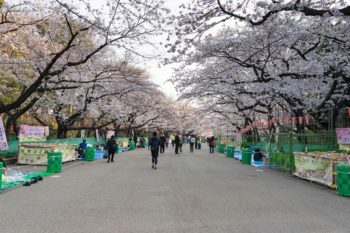 But if you come to Tokyo for the cherry blossom season, there’s no way around Ueno Park. 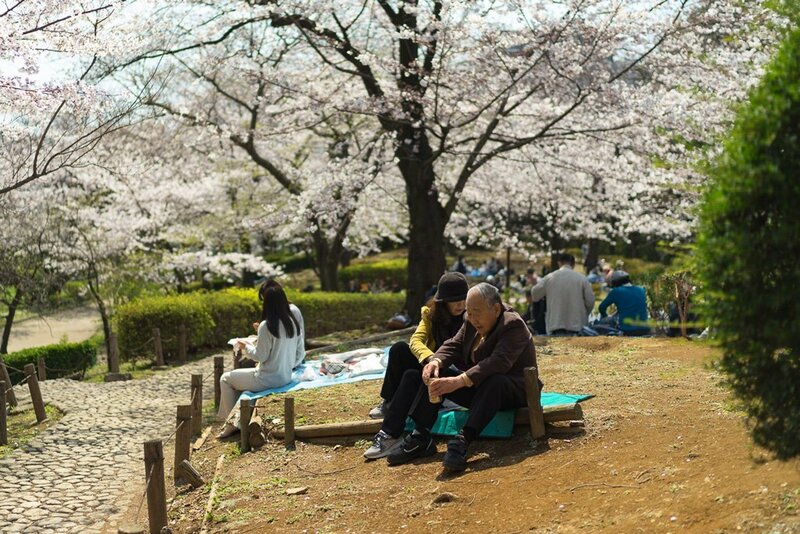 Of all the cherry blossom spots in the city, Ueno Park is no doubt the most popular. Our tip: The park is usually packed during the cherry blossom season. It’s even worse on weekends. We got there very early in the morning (around 6:00 am) and even then there were quite a few people out and about. 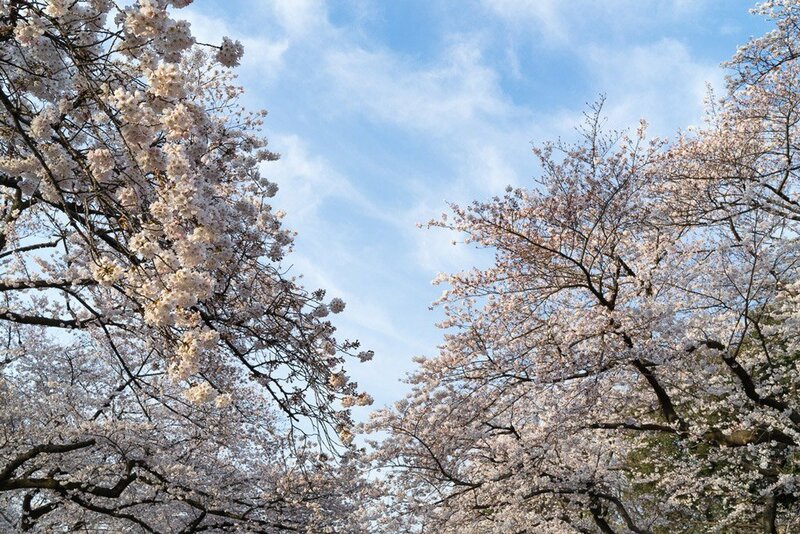 So if you want to take beautiful photos of the cherry blossoms, you should get up very early. 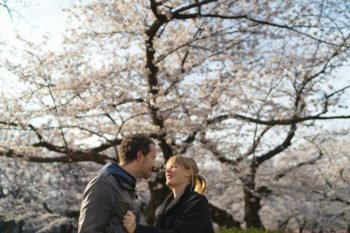 If you want to celebrate the cherry blossoms with the locals, go there later in the day, but be prepared for crowds. 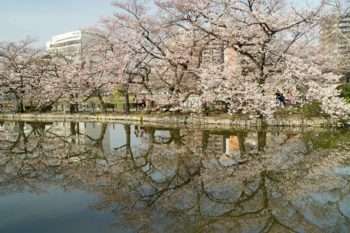 We actually found the cherry trees by the Shinobazu Pond, also located in Ueno Park, to be even more beautiful than the often-photographed cherry tree-lined path. 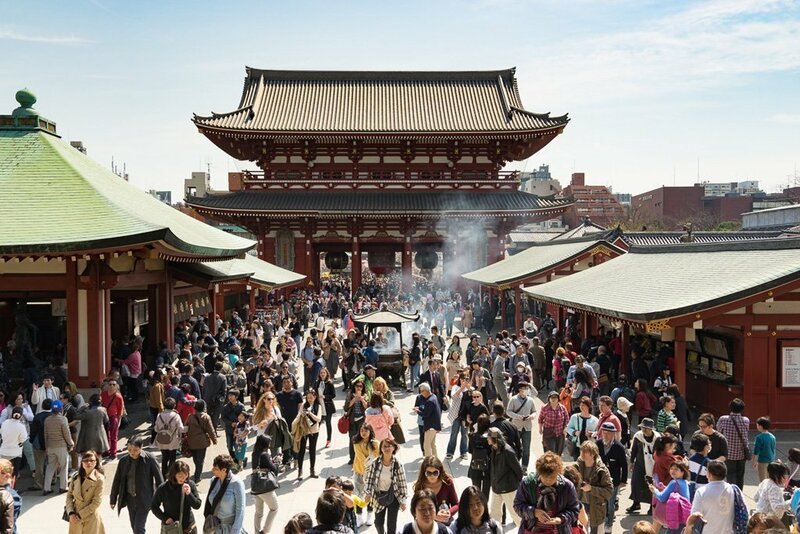 The Sensō-ji built in 628 is the oldest and most important Buddhist temple in Tokyo. Right next to it is the Asakusa shrine, which is about 1,000 years younger, but just as popular. If your idea of a shrine is a place of contemplative tranquility, then this might not be the place for you. Unless you arrive very early in the morning, you’ll be sharing the experience with masses of tourists descending on the grounds. That isn’t much fun and detracts from the shrine’s magic. 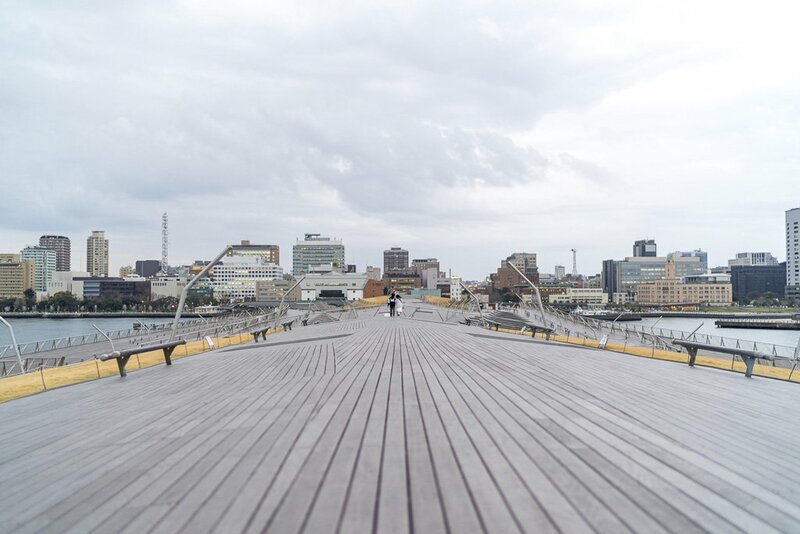 Sumida is located in the northeastern part of the city and has several sights and attractions to offer. 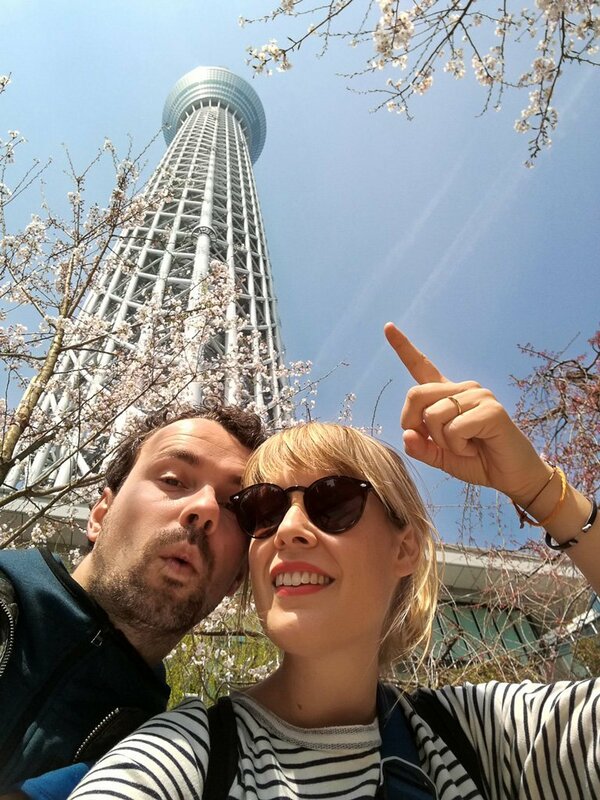 The Skytree is a TV tower with an incredible height of 634 meters, making it the second-highest building in the world after the Burj Khalifa in Dubai. 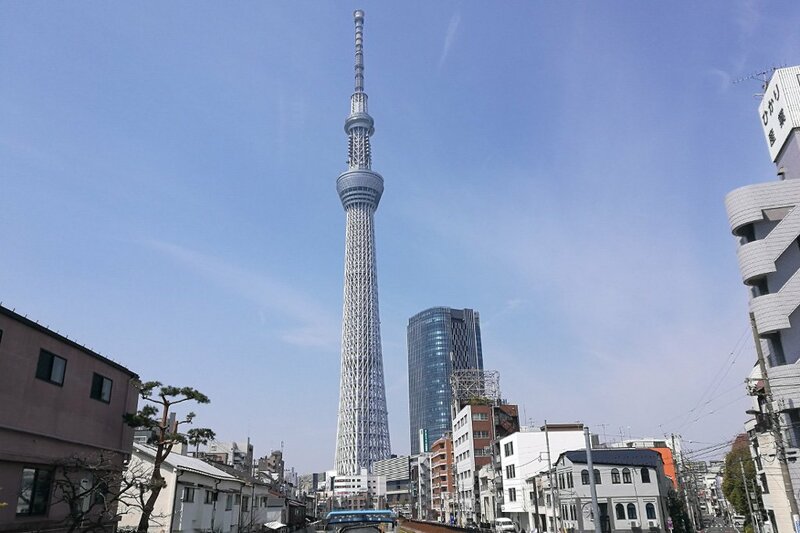 There are two observation decks on the Skytree, one at 350 meters and one at 450 meters. Admission to the lower platform costs 2,000 yen (24 euros), and if you want to go up even higher, you have to pay an additional 1,000 yen. It’s not worth paying the extra 1,000 yen for the view alone, but it’s much emptier on the upper deck, so it’s much better suited for taking pictures. Unfortunately, it isn’t possible to buy tickets for the Skytree online, so you may have to stand in line for one or even two hours. But if you’re pressed for time there’s a fast lane for foreigners, where you can get a ticket right away. It costs 1,000 yen more, but it’s worth it for the time you save. You’ll need to bring your passport to use the fast lane. Climbing the Skytree is only really worthwhile in clear weather. Then the view is simply amazing. But if it’s misty or foggy, the view is rather disappointing. 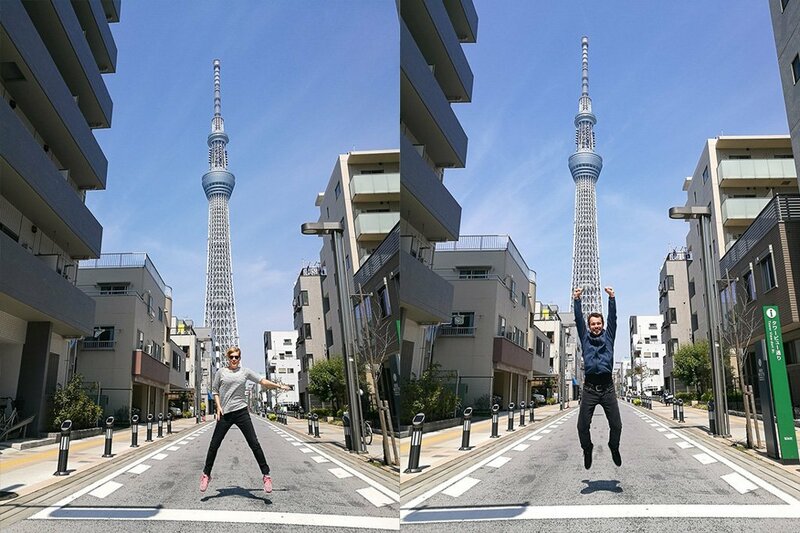 Our tip: We discovered two beautiful photo spots to take pictures of the Skytree. The Jukken Bridge (in Google Maps), which leads over the small channel, offers a nice view. The small street leading up to the Skytree on the south is a great place for selfies (here: photo location for the Skytree), or just try taking pictures from under the Skytree. Sumida Park is a small park not far from the Skytree. 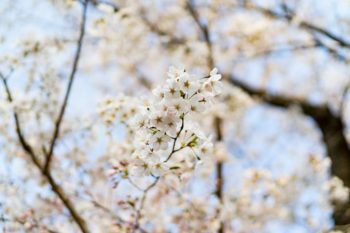 During the cherry blossom season, it’s one of the most beautiful places in Tokyo. 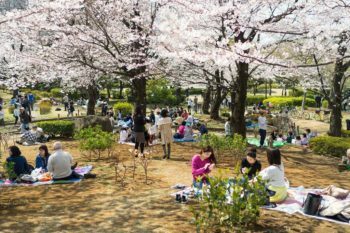 At lunchtime, the park is teeming with locals who meet for lunch under the cherry trees to enjoy sushi on their picnic blankets. Asahi is one of the most popular beers in Japan. 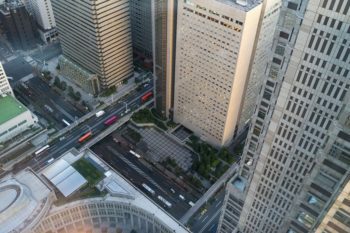 The company’s somewhat eccentric headquarters are located in the neighborhood of Sumida. The office building looks like a huge beer glass. 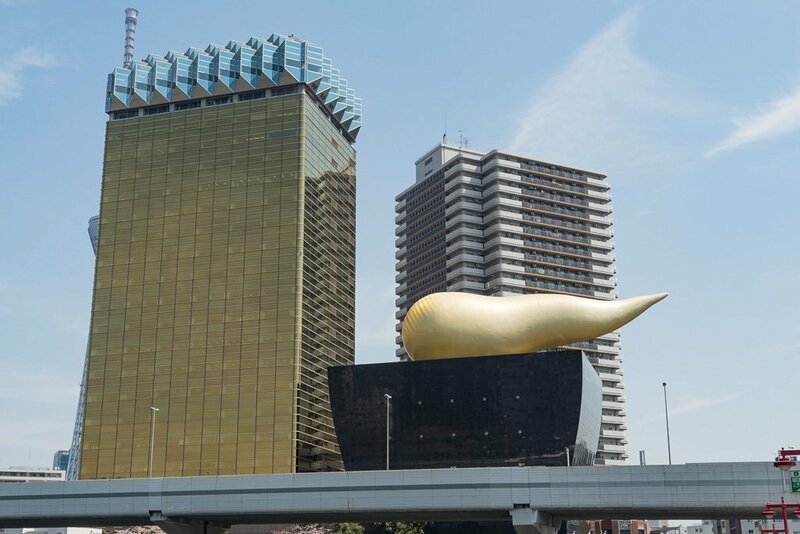 Right next to it is the so-called Asahi Flame, which is colloquially referred to as the ‘golden turd’, and you can easily see why. The best view of the building is from the opposite side of the river or from the bridge. Minato is located in the south of Tokyo’s city center and also includes the offshore island of Odaiba. 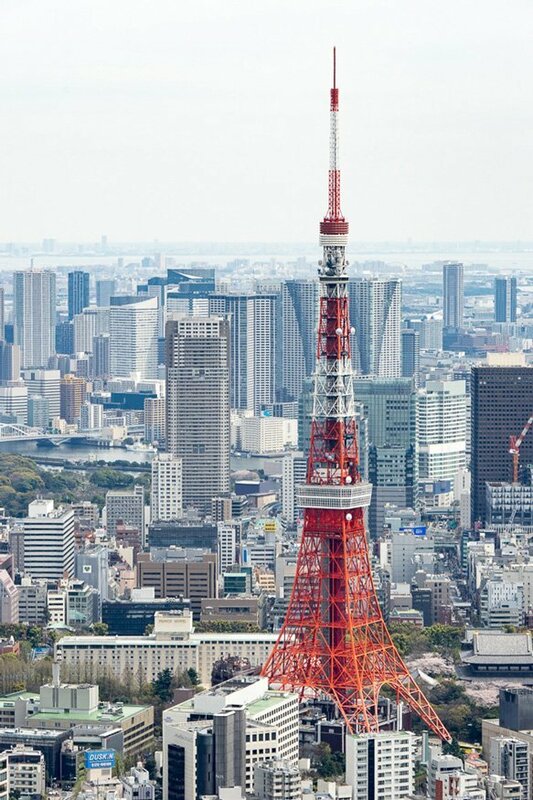 The Tokyo Tower is one of the most famous landmarks of the Japanese capital. The tower doesn’t just look like the Eiffel Tower in Paris. It’s actually a direct copy of the famous original. 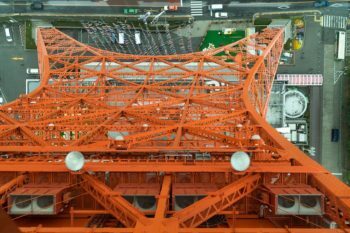 But since everything in Japan always has to be a bit bigger and better, of course the Tokyo Tower is 8 meters higher than the Eiffel Tower. he upper platform was under renovation during our visit, so we only visited the lower one. But we read that the upper platform isn’t really worth it anyway. The view from the Tokyo Tower is magnificent and in some places you can even look down to the ground through a glass floor. This is a view you can only get through the glass floor on the Tokyo Tower. Roppongi Hills is a major urban development project in the Minato district with offices, shops, and restaurants. The Mori Tower is the largest building in Roppongi Hills and has a very special observation platform. 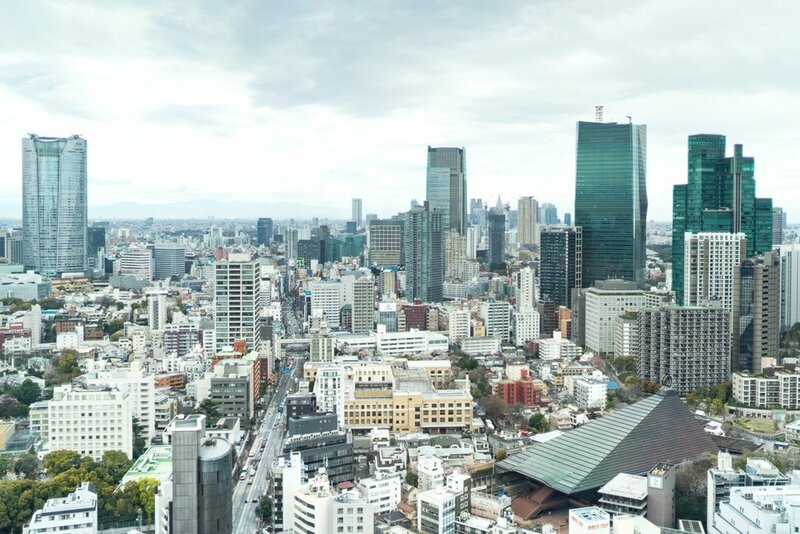 It’s the only viewpoint in Tokyo without any glass windows to obstruct your photos. 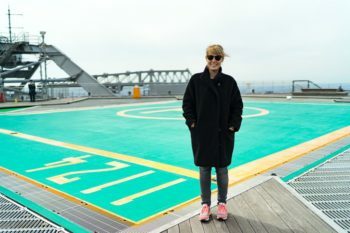 There’s a helipad on the roof of the tower and the walkway leading around it is open to the public. One floor down, there’s also a closed viewing platform that also offers a great view, but behind glass windows. The sky deck is only open in good weather. You can’t go up if it’s raining or too windy. The lower platform is always open. 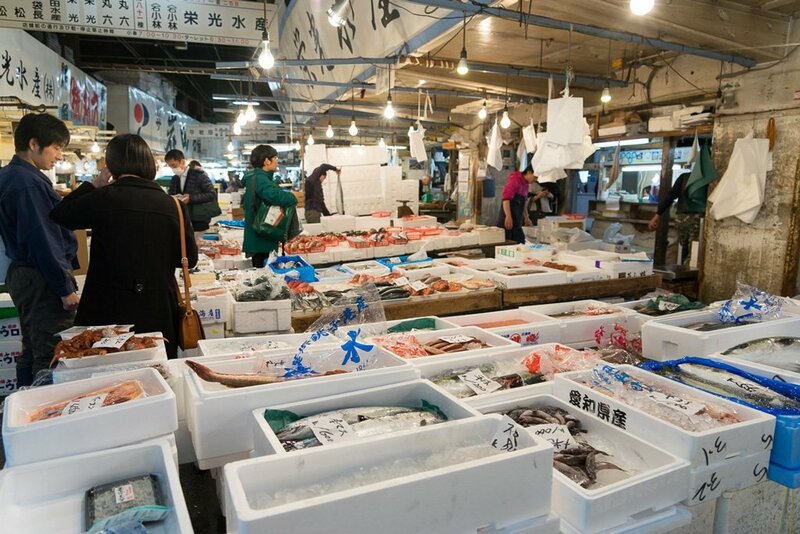 Tokyo’s fish market is the largest in the world. There’s a huge fish auction in the morning starting at 5 am, where the gigantic tuna fish are auctioned off to the highest bidders. A maximum of 120 tourists per day are allowed to attend this spectacle. The seats are assigned on a first come, first served basis, so get in line before 5 am at the Osakana Fukyu Center. If you’re late, you can’t go in. The 120 lucky ones are only allowed to watch the events for about 20 minutes and some people who went told us that it isn’t really worth it. So we chose to give it a miss and sleep in instead. At 10 am, the market opens its doors for tourists. Please note: Many travel guides and online resources list 9 am as the opening time, but that seems to have changed recently. The activity on the fish market is really interesting and it’s pretty impressive watching the huge tuna fish being professionally cut up and the general hustle and bustle. However, the fish market isn’t primarily a tourist attraction. First and foremost, it’s really hard work and people are constantly driving around the market with stacking vehicles. So you’ll always be standing in the way as a visitor and not all traders like to have their photo taken. 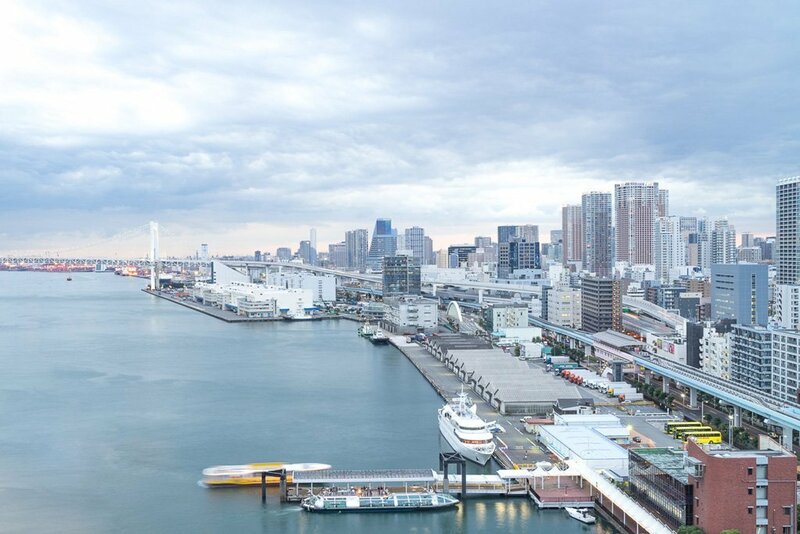 Tokyo Bay is ideal for an evening stroll. 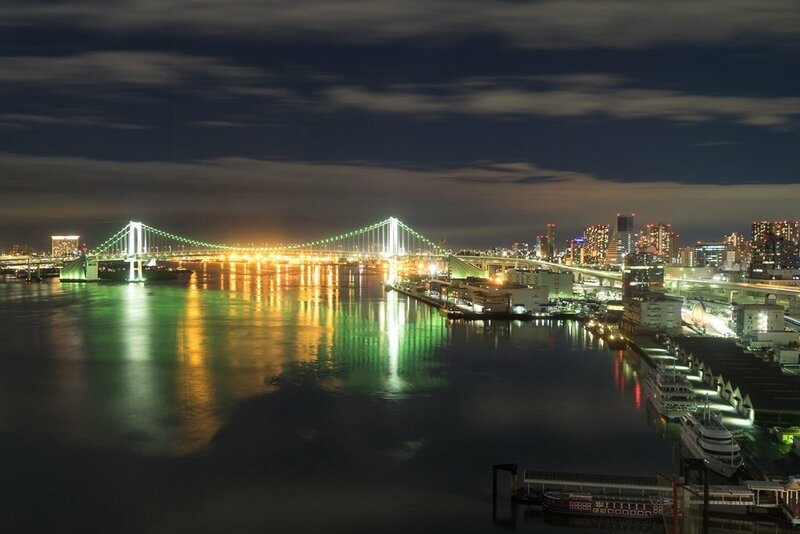 Then the Rainbow Bridge, which leads to the offshore island of Odaiba, shines in different colors and makes for some great photos. The Hamarikyu Gardens, one of the most beautiful parks in Tokyo, are also well worth a visit. 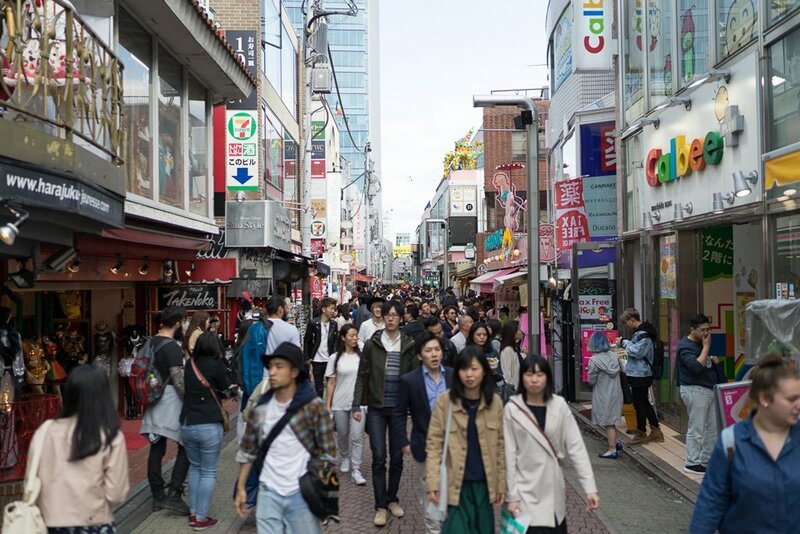 Shinjuku is located in western Tokyo and is definitely one of the most exciting districts in the city. The small alley with the charming name Piss Alley is actually called Omoide Yokocho and is just around the corner from Shinjuku Station. 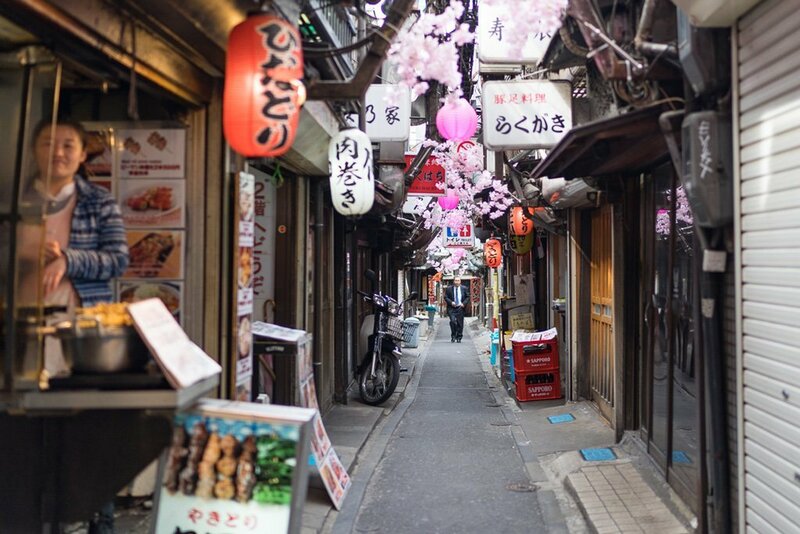 The alley is really just over a meter wide and looks a bit out of time in neat and tidy Tokyo. 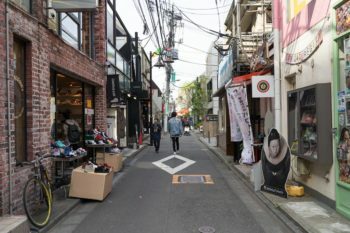 Left and right of the alley are small restaurants offering delicious soups, fish, and grilled meat. The restaurants are tiny and generally only fit 5-6 people at the small counters. Opening hours: The restaurants are usually open until midnight, many of them even opening at lunchtime. Piss Alley in Shinjuku – We had delicious soba (noodles) at this small corner restaurant. Kabukichō is a huge amusement district that starts right in front of Shinjuku Station. It’s still relatively quiet here during the day, but it’s worth going on a daytime photo walk. In the evening, the countless neon signs light up the night. In addition to red light establishments, Kabukichō has countless restaurants, clubs, bars, and arcades. Kabukichō is also one of the few places in Tokyo where you really have to be a bit careful. Some places here have been known to cheat tourists. Opening hours: Restaurants usually open from noon, bars only in the evening. Golden Gai is a small area in Kabukichō with lots of tiny bars. The narrow streets are very photogenic, but we recommend taking photos here during the day. The bars are still closed then and you can take pictures in peace. In the evenings, tourists taking pictures aren’t as welcome. Most of the bars in Golden Gai are hardly bigger than a living room with just enough space for 6 to 8 people. They often charge a cover of 500 to 1,000 yen in addition to the price of the drinks. Opening hours: Most bars open from 7 pm and stay open until late at the night. Many bars close on Sundays. 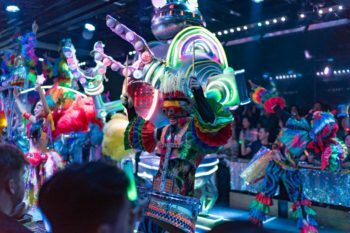 We spent a long time wondering if we really wanted to pay a visit to the Robot Restaurant. After all, admission is pretty steep at more than 60 euros. But in the end, we decided we couldn’t pass up the opportunity. 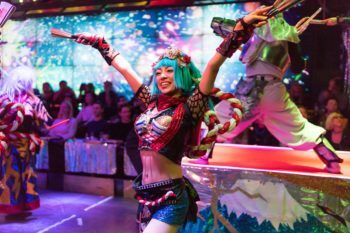 The name Robot Restaurant is actually somewhat misleading because it hasn’t really got much to do with a restaurant in the traditional sense of the word. It’s actually more of a show, and a rather crazy one at that. It’s hard to put into words: It’s loud, it’s dazzling, it’d completely wacky, and pretty pointless. 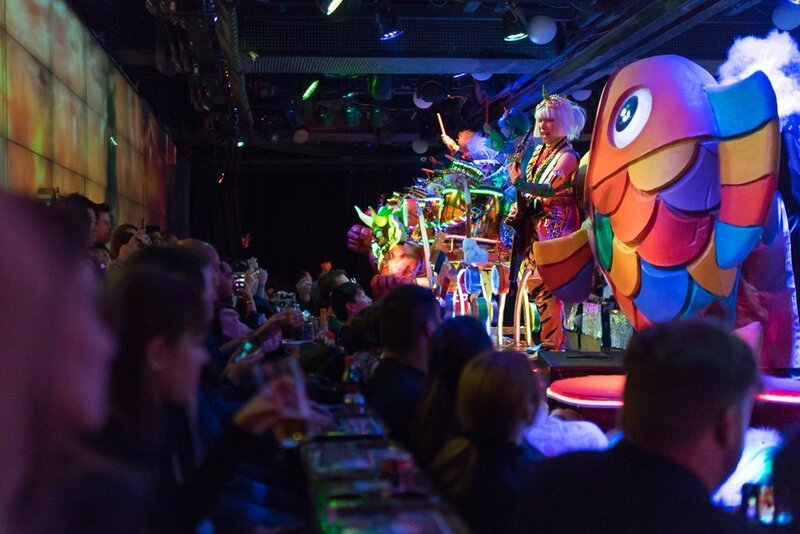 But regardless, or perhaps even because of it, we’d recommend visiting the Robot Restaurant for everyone. It’s a completely one-of-a-kind experience that you won’t forget so quickly. 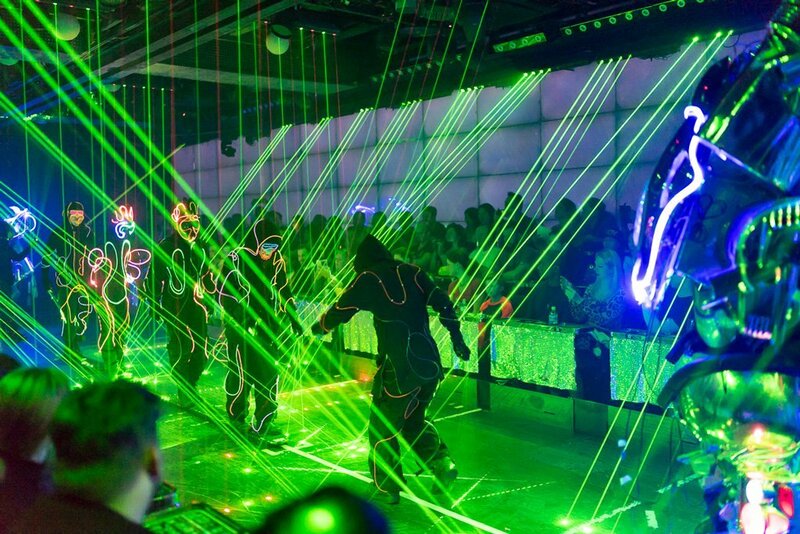 Our recommendation: You have to check out out the 90 minutes of senseless madness at the Robot Restaurant! But be sure to get tickets a few days or even a few weeks in advance, as the shows are usually sold out. Tip: You can book the tickets directly on the organizer’s website, but we recommend buying the tickets online here because they’re usually a few euros cheaper on getyourguide. Opening hours: There are four shows every day: 4 pm, 5:55 pm, 7:50 pm, and 9:45 pm. 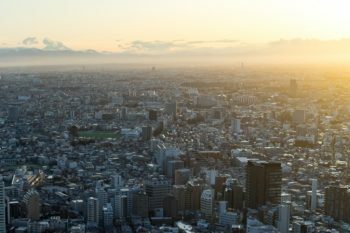 Tokyo has a lot of great viewpoints, but you’d run up quite a bill if you wanted to visit them all. Tokyo’s city hall, the Metropolitan Government Building, offers a very good free alternative. The building has two towers, both of which have an observation deck. It’s generally worth visiting both towers as you can see other things from each of them. You can visit the observation decks free of charge, but you need to be a bit patient waiting for the elevators. It took about 15 minutes when we were there. Harajuku is a neighborhood in the district of Shinjuku mainly known for its youth culture. Especially on Sunday, the cosplay scene meets on the bridge between the train station and Yoyogi Park, which is also worth seeing. Cosplay is a popular subculture in Japan where mostly young people dress up elaborately in the style of manga and anime figures. Unfortunately, it rained hard all day long in Tokyo on Sunday, so we couldn’t watch the spectacle. But we’ll be back! Harajuku is worth a trip regardless. The area has lots of stylish clothes stores, cool bars, and cafés, and a whole lot of hipsterdom to offer. We really liked it there and it’s really fun to stroll through the streets of the neighborhood. 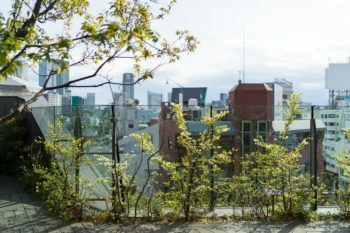 There’s a really cozy roof terrace on the roof of the Tokyu Plaza in Harajuku where you can relax from the hustle and bustle of the city. 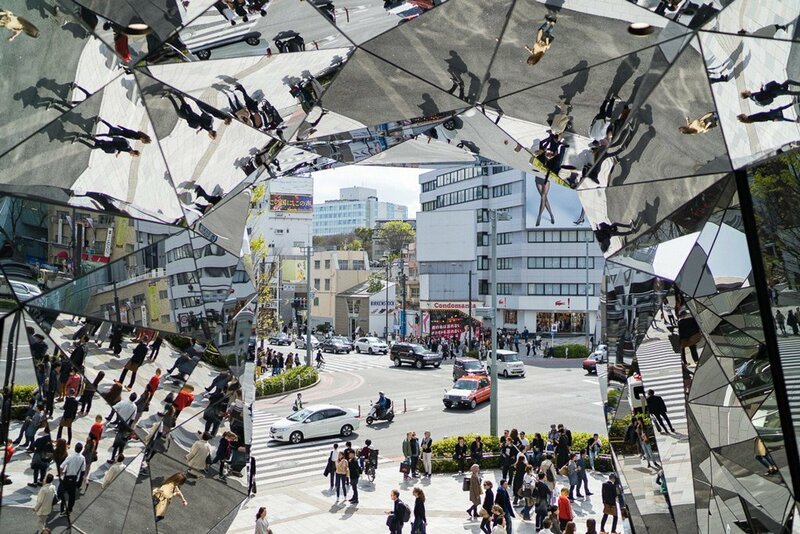 Tokyu Plaza Harajuku – the entrance of the shopping center is a very good spot for some great photos. The next time we’re in Tokyo we really want to go there in the evening. Shibuya is located in the east of downtown Tokyo and is especially popular with younger Tokyo residents as a shopping and entertainment district. Shibuya Crossing is probably one of the most famous crossings in the world. At this intersection, all pedestrian lights turn green at the same time, and hundreds or even thousands of people cross the intersection at each green phase. This spectacle is an absolute highlight and so typical of this crazy, overcrowded, and hectic city. Simply wonderful! Opening hours: It’s really lively here from about 8:00 am to 10:00 pm. Shibuya Crossing – 0.6 second exposure. There’s a statue of a dog in front of Shibuya Station. That sounds relatively unspectacular at first, but this statue is still a real attraction that draws hundreds of tourists every day. Because the story of Hachikō is heartwarming. The faithful dog picked its master up from Shibuya station after work at the same time every day until he suddenly died in 1925. 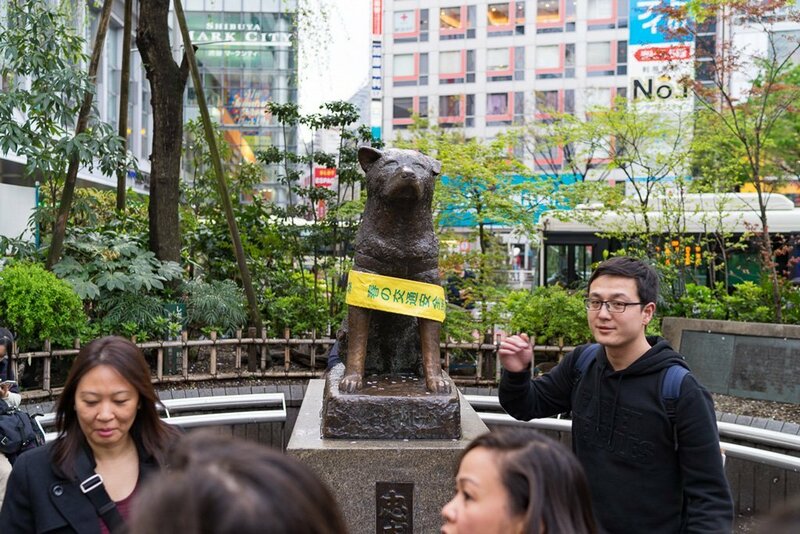 Nevertheless, Hachikō continued to go to Shibuya station every day to wait for his master and continued doing so for 10 whole years. And so Hachikō became known throughout the country as a symbol of a loyal companion. Isn’t that a nice story? Fittingly, the statue has become one of the most famous meeting places for dates in Japan. Although Tokyo itself is absolutely amazing enough by itself, it’s still worth going on one or the other day trip from Tokyo. 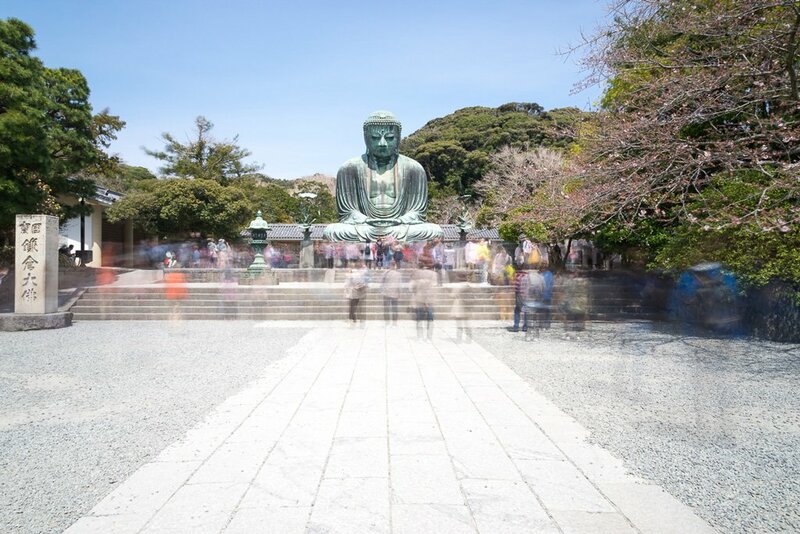 One of these trips leads to Kamakura to the south of Tokyo. There are several temples and an impressive Buddha statue there. On the way back it makes sense to stop off in Yokohama. A day trip to Nikko in the north is also highly recommended. Here you can find some of the most important and beautiful shrines in all of Japan. It’s also home to the three famous monkeys Mizaru, Kikazaru, and Iwazaru: see no evil, hear no evil, speak no evil. You can also visit Mount Fuji as part of a day trip from Tokyo. But you should leave very early in the morning for that. If you want to more fully experience the area around Fuji, we recommend staying overnight. If you want to go on a more unusual tour far away from the tourist hot spots, you could also go to Mito to the northeast of Tokyo. Karaku-en, one of the three famous gardens in Japan, is located here. You can also visit an old manor house and a former Samurai school without being surrounded by crowds of tourists. It is absolutely impossible to completely cover Tokyo in just a few days. You’ll never have enough time for Tokyo unless you come here for half a year or so. We visited all the above-mentioned sights in 5 days, and dedicated two full days to excursions in the surrounding area. A week is a good guideline to at least see the most important sights in Tokyo and go on a day trip or two. If you’re up for a real sightseeing tour de force, you’ll probably manage the highlights in 3 days. But then your feet will really ache by the end of the day. You have to order the Japan Rail Pass before your departure! 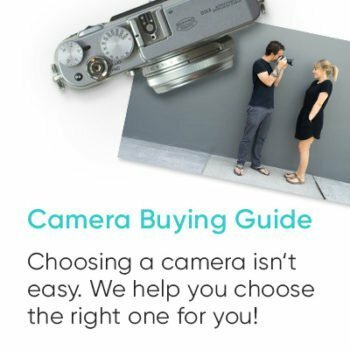 We explain how to do it! Tokyo’s public transport system is excellent. You can reach almost every corner of the city by subway and bus. Tokyo has a total of 13 metro lines that transport more than 3 billion people a year, more than anywhere else in the world. The Yamanote Line, which is operated by Japan Railways, the state-owned railroad company and which is also covered by the Japan Railpass, is also important. The Yamanote Line is a circle line that runs around downtown Tokyo and stops at many places of interest in Tokyo. The ticket vending machines look terrifying at first glance. However, there’s a small button on the display that switches the machine to English. Then the machine is relatively easy to operate. Metro travel is relatively cheap. A trip usually costs between 150 and 200 yen (1.20 to 1.60 euros). The best idea is to buy a Suica Card. You can top up this card with any amount of money and place it on the card reader at the turnstile before entering the platform and after leaving it. The fare is automatically deducted and you only have to use the machine for top-ups. The Suica Card is also available at any of the machines. There’s a 500-yen deposit, but you’ll get it back in the end. Conveniently enough, you can also use the Suica Card in other cities such as Osaka or Kyoto. Plus, you can use your card to pay in many stores and vending machines. However, you can only return the card in the Tokyo area. Day tickets for the metro are also available, but since different metro lines belong to different operators, a ticket for entire network is pretty expensive at 1,000 yen. It’s only worth the price if you really plan to use the metro a lot in one day. But take note that these tickets aren’t valid for JR lines and buses. Many subway lines run every 2 or 3 minutes during peak times. Even so, it can get crowded in the subways, especially in the morning and after work. If you’ve ever seen pictures of crowded subways with faces stuck to the windows – sometimes it looks like that, but not on all the lines. The last trains run between midnight and 1 am, and don’t resume service until 5 in the morning. If you want to go out in the evening, make sure to check when your last train leaves. There’s always a notice at the train stations showing the times of the last trains. Taking a taxi in Tokyo is relatively expensive, but the only alternative at night. Tokyo has two international airports: Haneda Airport to the south of the city and Narita Airport to the west. Both airports are very well served by public transport. Most international flights go to Narita Airport. The fastest and easiest way to get from Narita to Tokyo is the Narita Express. 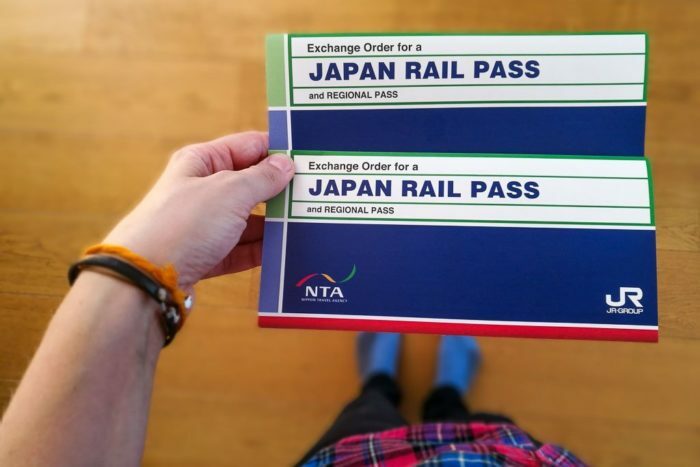 If you have a Japan Rail Pass, you use it on the Narita Express, which is very handy. After all, a ticket usually costs 3,220 yen (about 27 euros). It’s a convenient way to get to the most important stations in Tokyo, including Tokyo Station, Shinagawa, Shinjukum, and Shibuya, in less than an hour. The JR Sobu Line is a cheaper alternative, taking you to Tokyo Station for 1,320 yen (about 12 euros) in about 90 minutes. However, this train can get very crowded and is less comfortable than the Narita Express. Another alternative is the Keisei Limited Express, which takes you to Nippori Station in about 75 minutes for 1,090 yen. You can change to the Yamanote Line there and continue to your destination in Tokyo. The Keisei Skyliner also serves the same route as the Keisei Limited Express. For about 2,400 Yen (approx. 20 euros) this train runs to Nippori and Ueno Stations, where you can change trains. Taxis are also available, but they’re really, really expensive. One journey costs 20,000 yen, which is about 170 euros. Some international flights also land at Haneda Airport. If you’re lucky enough to land there, getting to the center is much cheaper. First you have to take the monorail to Hamamatsuchō Station. 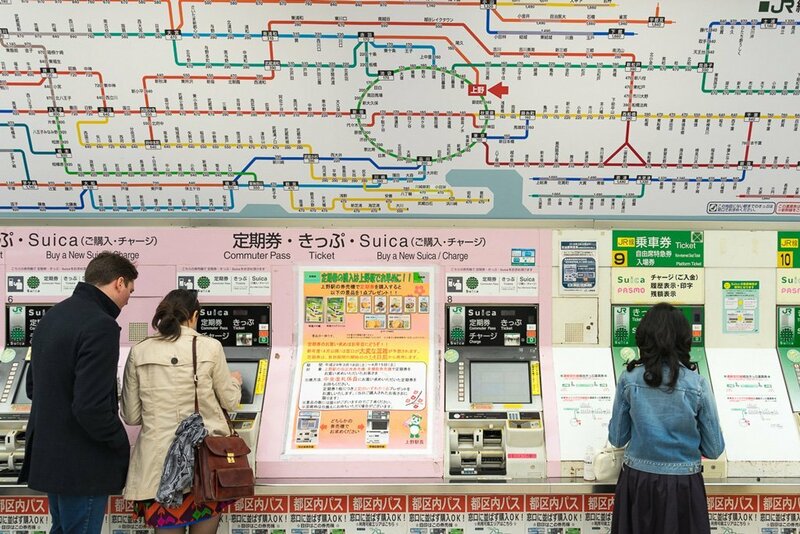 Once you’re there, you can change to the Yamanote Line, which will take you to Shinjuku and Shibuya Stations. The fare for the entire journey is only 600 to 700 Yen (approx. 5-6 euros). A taxi from Haneda Airport costs between 5,000 and 10,000 yen (approx. 45-90 euros) depending on traffic and time of day. Overnight accommodation in Tokyo is expensive, very expensive! Living space in the city is scarce and the size of the hotel rooms reflects this fact of life. You’ll have trouble finding anything reasonable for under 100 euros per night. 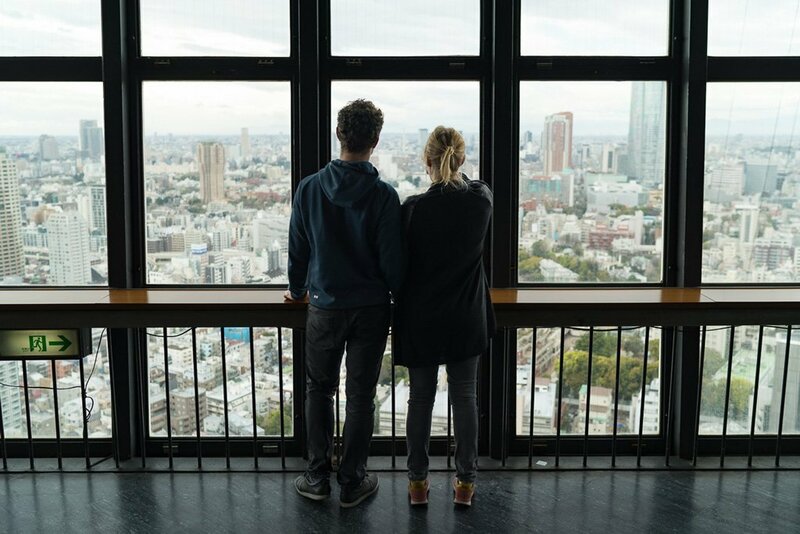 Tip: If you’re looking for a hotel in Tokyo, please read our post Where to stay in Tokyo to find out which part of Tokyo suits you best. You can find a list of all the hotels we stayed at in Japan here: Where we stayed in Japan & 7 hotel booking tips. The famous capsule hotels or dormitories in hostels are an inexpensive alternative if you’re on a budget, but a private room with your own bathroom will definitely cost you big bucks. 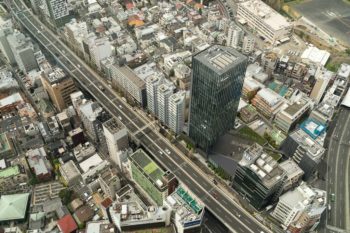 We stayed at the Super Hotel Lohas Akasaka, which offers a great value for money by Tokyo standards. The location is very good and the rooms are modern and clean, but you’ll have to get really organized to fit your bags, etc. into the 10-square-meter rooms. And for 140 euros per night, we would have expected a more comfortable bed. But now we’re just nitpicking. 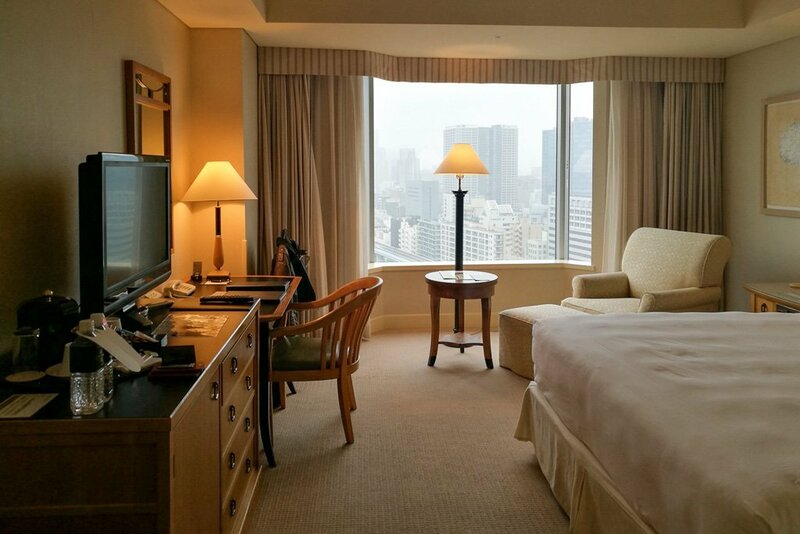 We also spent two nights at the InterContinental Hotel Tokyo Bay. Of course the rooms there are much larger, more stylish, the beds are much more comfortable, and the view is amazing! But the quality of the rooms and the location come at a price. Our room in the 17th floor of the InterContinental Tokyo Bay Hotel. We recommend that you book your hotel in Tokyo (this also applies to all other places in Japan) as far in advance as possible, because the hotels with the best value for money get snapped up very quickly. Unless you’re an avid smoker yourself, make sure you book a non-smoking room! Japan is still a country of smokers, although that’s starting to change. Hotels outside the center are obviously cheaper. But that means joining the working population on their daily commute to the city center and back again every morning and evening. Taking the metro is no fun in the overcrowded trains at rush hour. We were just glad that our hotel was right in the center so we only experienced a watered-down version of this. If you don’t want to explore Tokyo on your own, we recommend booking a local guide. 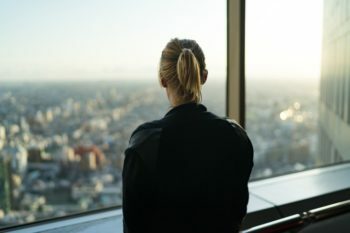 Not only does this allow you to get through the city stress-free, but you’ll also receive a lot of insider tips from a local. We’ve picked out some exciting and unusual city tours for you to book online. 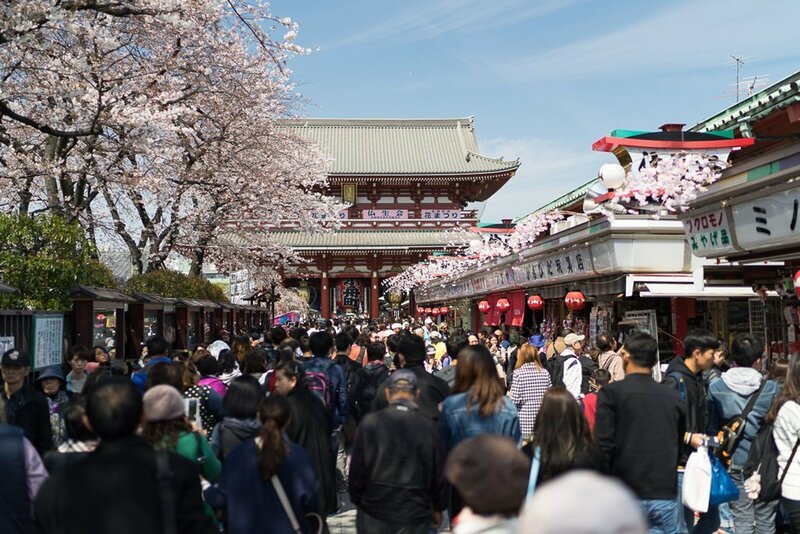 Morning trip to the temples and shrines: This tour takes you to the main temples and shrines of Tokyo. 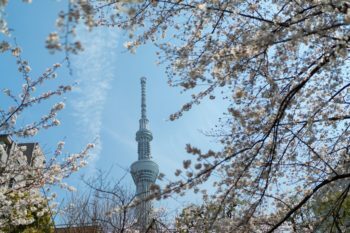 With a bus and an English-speaking guide, this tour will give you a good introduction to the historical side of Tokyo. Cycling tour through Tokyo: Discovering Tokyo by bike is a completely different experience. But it’s not that dumb an idea, because you can cover quite a lot of ground in a short time. 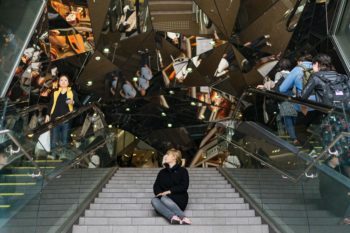 Private day tour through Tokyo: On this tour, you’ll have a private guide all to yourself for a whole day. 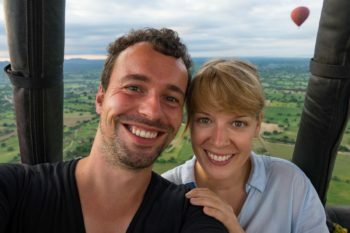 This is our favorite kind of tour, as you can put together a very individual agenda and communicate with the guide much more intensively than on a group tour. 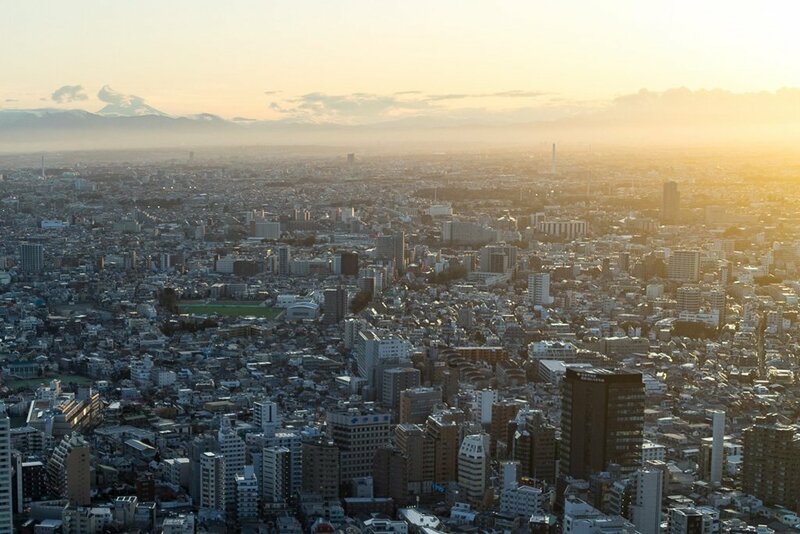 We hope our Tokyo travel tips have been helpful for planning your trip. Of course we always look forward to hearing from you in the comments. What attractions in Tokyo did you like the most? 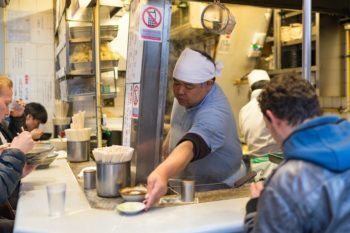 Do you have a great tip you’d like to share with all future visitors to Tokyo?